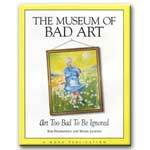 Open Edition deluxe prints painstakingly reproduced from the Museum of Bad Art collection, Museum of Bad Art: Masterworks. Select a print on the drop-down list above. 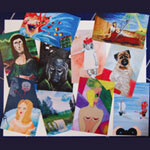 Many of the available prints are shown below. Prints from almost all MOBA collection works are available. You may also contact us if you have any questions. Print size: approximately 13" x 19". Print paper: 61 lb. matte (230 g/m2, 11 mil).